Have a question? Tweet at us or email us using #AskDuelCircle. This is a space where we focus on your questions and give you answers. We’ll be doing these periodically from time to time so keep an eye out for future editions of #AskDuelCircle. This week it’s all about tournaments…and Steve. Will you ever archive past gamemodes? Can I use them for my own tournaments? This is a question that we’ve discussed internally since the beginning of Clash in 2015. Our intent was to always create things that anyone else could use at their discretion. We honestly feel honored when other people have an interest in some of our rulesets and use them in their own tournaments. Right now we’re trying to find the best way to have this information easily accessible to you. Whether it’s through ManderBot in the future or through a specific site page, this is one of our biggest goals right now and should be available fairly soon. We absolutely understand how the only current way to research our past gamemodes is through Twitter searching or through our YouTube VODs and that’s definitely not okay. I want to participate in tournaments like Clash but I want to know the statistics such as winrates from first. Is this something you’re working on for ManderBot? Ah yes, a statistics question. Since the beginning of Clash and DuelCircle respectively, we’ve had around 500 total matches. Our of those 500 or so matches, I would say maybe 15-20% of those were streamed. The problem with not having access to Wizard101’s API is that we don’t have statistics for every match. Internally we only have statistics as to who each participant faced, and who won. We’ve been wanting to calculate statistics and gather tons of data since the beginning of Clash. When we created Clash, we wanted to see what would happen in a controlled environment. Right now, even if we were able to calculate things based off of recordings, it would still be inaccurate since we didn’t measure every match. For ManderBot, this is something very unique and something we’ve been considering for the future. It wouldn’t be an easy task but at DuelCircle we highly value stats and we would love to release them publically not only for our participants but for KingsIsle to review as well. The easier and obvious data that we do have though is that Fire is one of the most prominent schools that compete in our tournaments and usually make it to the finals while Myth is beginning to gain traction in our tournaments and shouldn’t be overlooked. Do you have a nickname for your referees like the “ManderSquad”? Who is Steve and why do you keep tweeting about Steve?!? Thanks for reading this rendition of #AskDuelCircle. Have a question? Tweet at us or email us using #AskDuelCircle. Please feel free to hit us up in the comments. The organizational team and content team will do their best to engage in a conversation with you. We want this to feel like it’s offering a deeper insight into our work. 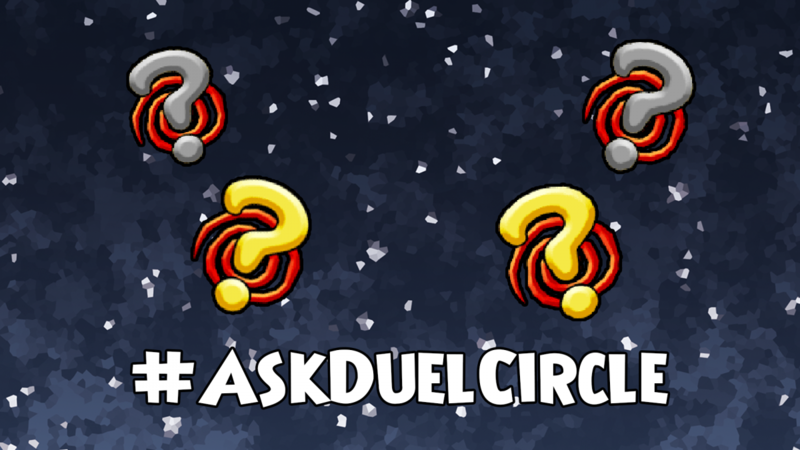 Check out the last #AskDuelCircle here.